Karamsar Poultry Equipments is a name that you can rely upon. 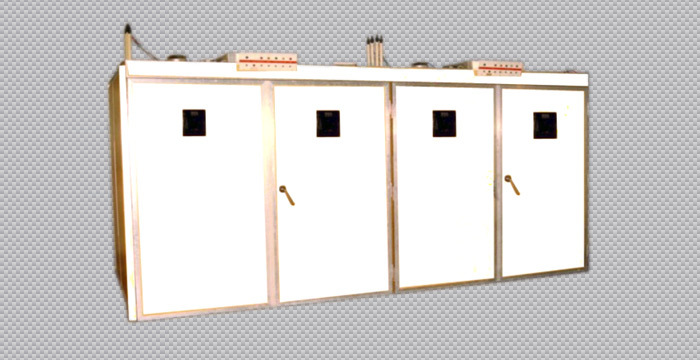 We are the top poultry hatchery manufacturers in Delhi NCR. Our range of products are supplied PAN Indian and overseas as well. Salient features of hatchers include – electrical calibration, thermometer and hygrometers, humidistat, alarm bell, hatcher basket, cabinet, cooling system, exhaust ventilation, control unit. Some of the features that make our hatchers special are – different capacity, lightweight but robust, excellent ventilation provided for chicks and eggs, free floor space for easy cleaning, and possesses all internal components for food safety. If you’re looking for premium quality poultry hatchery manufacturers, then Karamsar is the one stop shop. Steel Trolly, Light, in weight but Robust. 4 Heaters, each of 500 watts (per compartment) Electrical requirement for a machine is approx. 3 KW for a Hatcher. When the Hatcher has once acquired its working Temperature, the electric, requirement will be 1-2 KW per compartment. Calibrated Thermometers of highest accuracy installed behind glass window for reading Temperature and Humidity in the cabinet. Easily, without opening the doors. Hatcher Baskets are made of high grade Plastic for durability and resistence to sanitise modren chemicals. Contact Thermometers operates automatically to control the solenoid valve for regulating water flow for humidifier and cooling system. Life long STAINLESS STEEL humidity guard provided. Automatic Exhaust provided for Cooling System. Electronic horn is provided for indicating rise or fall in Temperature or failure of electric supply. The cabinet wall panels are made of fibre with thermocol insulation within and Trollies of thick iron painted with synthetic & with rust proof bolts and nuts. Machines can be dismantled to facilitate their passages through a normal size door. Control Panel provided, on front for quick accessability and to operate machine easily.